Bottled by J&W Nicholson of Clerkenwell, London, back in the 1970s. Base stock is unknown – it might be from Caroni, yet somehow I doubt that – it lacks something of the tarry background. No information is available on age or blend of ages. Bottled at 42.8%. J&W Nicholson was a gin maker which opened its doors in the 1730s. They ceased UK gin production in 1941 (wartime rationing made it impractical) and sold their facility there in 1966, eventually selling the remaining business to the Distillers Company Ltd in the 1970s…at first I thought this rum seems to be an effort to diversify production as a consequence of the economic hardship which forced the sale, but further reading shows the company had been issuing rums for more than a century before. Distillers Company sold out to Guinness in 1986, and the DCL brand was in turn consolidated by Diageo in 1997. Nose – Fairly soft and warm. Initial aromas of butterscotch and eclairs. Salty butter. Caramel. Faint whiff of meatiness, a musky taint of mushrooms, and fruit starting to go. Palate – Medium heavy, still warm and a little sharp, not unpleasantly so. Creamy and also a little musty, like a room left unaired for too long. Coconut shavings, caramel, brown sugar predominate. With water, coconut recedes, and smoke and dry leather come forward, along with cloves and a bit of cinnamon. That salted butter and musky background never entirely disappears. Odd mix of tastes, all in all. No tar and asphalt notes make themselves known, supporting my contention this was unlikely to be a Caroni. 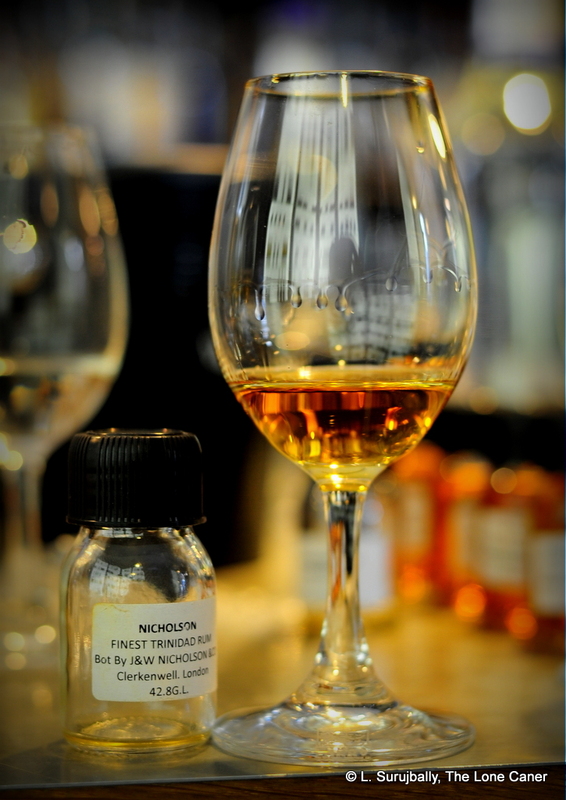 Finish – Short and smooth, heated….some crushed walnuts and toffee there, with a last flirt of mustiness and smoke. Thoughts – Nothing special. At best it’s a five-to-eight year old. It’s not really complex or world beating, and not a sipper’s dream by any stretch. The nose is the oddest thing about it since it seems to stand quite separate from the way it tastes when you drink it. But overall, a decent enough rum, quite pleasant. I liked the history of the company almost more than the rum.